Mr. Magnoli is passionate about his work and it shows. "Bespoke" describes best both the process and the product involved. 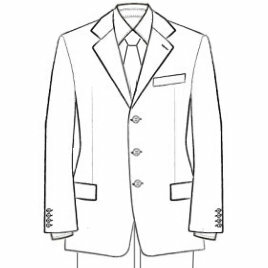 I've purchased many suits off the rack over the years and the tailoring is simple - hem measurement here, chalk slashes around the legs, suit ready Thursday. I visited Mr. Magnoli to have him create a suit for me. Instead of looking through racks of pre-made suits, we spent a couple hours poring over fabric swatchbooks. Then we discussed the style in exacting detail. Number of buttons, two piece or three piece, pocket styles and numbers, jacket, lapel length and shape as well as various bits of minutiae I can't recall. He also mentioned the historical and stylistic evolution as we went along. After that were a couple dozen measurements. Everything is specified precisely. When I finally received my suit, it was then that I understood what "suit" really meant. The cut and fit is uncannily good. Highly recommended.